Last week after a successful result on the scales I decided I need to get my head back into my Weight Watchers diet and was all prepared when a friend reminded me of our plans to meet for dinner. There would be no way I would turn down an opportunity for dinner - my weight doesn't bother me enough not to enjoy a good meal - but I still wanted to be mindful of my WW points and not ruin all my good efforts. It's not unknown for me to peruse the menu in advance of wherever I may be dining no matter how many times I have eaten in said restaurant but it also comes in handy to have a browse through when you're on a diet to see what your healthier options are, make a decision and then you have more chance of not losing all willpower once you're surrounded by the delicious smells coming from the kitchens. If like me you are on WW you can also type meals into your handy app to see what the point allowance would be and therefore plan your week around it rather than what can often be the case of typing the points in after the event and realising you're on lettuce leaves for the next 3 days. 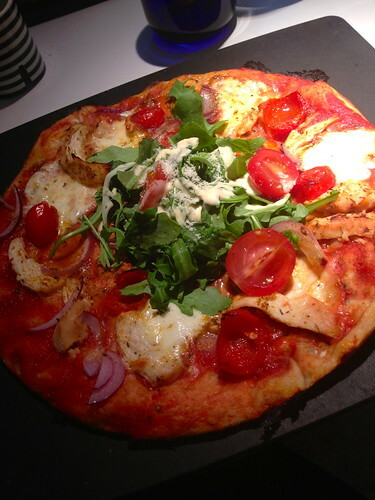 The chosen restaurant was Pizza Express where I would usually chose the Pollo Ad Astra so I was delighted to see this was available in the low calorie Leggera option. For fellow weight watchers this was a 7 point difference and we all know those 7 extra points throughout the week would be very welcome. So how did the Leggera stand up to it's higher calorie friend? I was very impressed and whether dieting or not I would go for this option. The selling point of the Leggera is it's hole in the middle filled with rocket, this was a big plus for me as I often find with a pizza I want some greenery on the side so this fulfilled that request without the need to pay for a side order. Other than the hole in the middle I couldn't see any other difference to my usual pizza so it was a definite thumbs up and I was able to enjoy my usual pizza whilst still diligently following my diet. What are your tips for eating out when you're dieting? I'm very lucky that I've never needed to diet, but if I did I certainly couldn't live without pizza!